merksamer asked how well game played, so I’m reposting my reply for anyone interested. It plays very well, actually, despite the tons of cards and counters. Combat is pretty simple and doesn’t take long to get the hang of. There are all kinds of magic and mundane items, allies, and spells to acquire and different events each turn, but it’s not overwhelming. The monsters that spawn from the gates move on their own, based on the event card that is drawn each turn, so one person can technically play the game solo. The only problem I had at first was figuring out what the hell I was supposed to do. 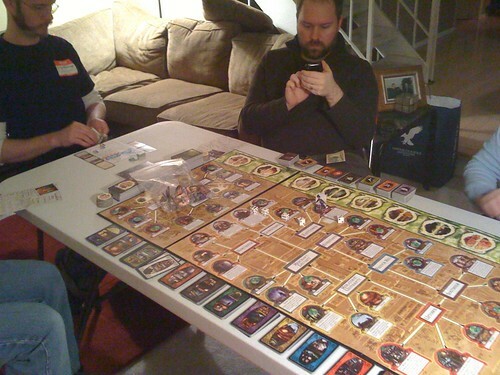 Initially we were just moving around the board collecting clue tokens. What happens is every turn a gate will open in one of the city locations and spawn some kind of monster, who will usually move away but leave the gate open. The goal is to either close all of the gates so there are none open on the board at the end of any given turn, or seal five locations so a gate cannot open there. While you’re doing this, one of the Great Old Ones (drawn at random during setup) gets closer each turn to waking up so, if you haven’t closed or sealed the necessary gates, you have to fight it and will probably lose. We drew Cthulhu itself, but a lucky card draw and feverish dice-rolling allowed us to close all the open gates in the same turn, winning the game. I added the game to my Amazon wishlist last night, but it’s out of stock from Fantasy Flight’s online store. Haven’t checked Amazon itself yet. mrimp and odysseyseven showed up around 7:30 with Nick and Brian to play Arkham Horror, a board game based on the Cthulhu mythos and setting. Players take the role of investigators of the occult in 1920s Massachusetts, trying to close gates to other dimensions that pop open at random throughout the fictional city of Arkham, spewing horrible monsters into the waking world, while trying not to die or go insane. Yeah, but in this version, when you land on Boardwalk, it eats you.